Spotting the difference between cancerous tissue and normal tissue is a challenge, even for highly-trained surgeons. The standard method, called Frozen Section Analysis, is slow - taking 30 minutes or more to prepare and interpret. All the while, the patient must be kept anesthetized. Now, however, engineers at the University of Texas at Austin have developed a new tool that they claim can perform the same task in about ten seconds. It's called the MasSpec Pen. “If you talk to cancer patients after surgery, one of the first things many will say is ‘I hope the surgeon got all the cancer out,’” says Livia Schiavinato Eberlin, an assistant professor of chemistry at UT Austin who designed the study and led the team. In tests on 253 human cancer patients, the MasSpec Pen was able to give a diagnosis within ten seconds that was not only 96% accurate, but also able to detect cancer in regions between normal and cancerous tissues. It works by releasing a drop of water onto the tissue, then sucking it back up. The resulting sample is then evaluated in comparison with a database of samples gathered during the testing process. Those included normal and cancerous tissues from the breast, lung, thyroid and ovary. When complete, the words "Normal" or "Cancer" appear on a computer screen. 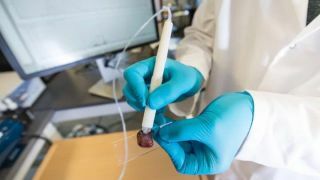 “When designing the MasSpec Pen, we made sure the tissue remains intact by coming into contact only with water and the plastic tip of the MasSpec Pen during the procedure,” says Jialing Zhang, research associate at the Eberlin Lab at UT Austin who led the experimental work. The full details of the project were published in the journal Science Translational Medicine.